↑ "Discontent over Sudan census". News24.com. AFP. 21 May 2009. पहुँचतिथी 14 July 2011. ↑ 3.0 3.1 3.2 3.3 "South Sudan". World Economic Outlook Database. International Monetary Fund. 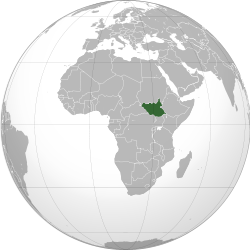 ↑ "New country, new number: Country code 211 officially assigned to South Sudan" (Press release). International Telecommunication Union. 14 July 2011. पहुँचतिथी 20 July 2011. ↑ ".ss Domain Delegation Data". Internet Assigned Numbers Authority. ICANN. पहुँचतिथी 1 September 2011.